The set contains two distinct functions, the current injection and the voltage measurement. In the injection of current, a variable autotransformer of current regulation is connected to a current producer transformer with various ranges of output. The current produced is measured with a shunt system connected to a digital instrument. This system of current injection makes possible to shift the current 180° in order to avoid possible stray current over the ground. The voltage in step and touch measurement is made up with a digital voltmeter of 3 1/2 digits with a input designed so that the ohm resistance will be 1 KV. The precision of this set is ±1%. - This set is designed to test ground circuit measurements, in what is called voltage in step and touch according to IEC standards used in some countries. - ACCESSORIES for measurements incorporated. - Inversion of current output. 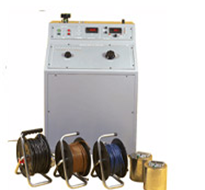 - Regulation: 0-50A / 50KVA.